I caught some flak yesterday from friends who were surprised by the tone of my article “Skyfall’s Hard Landing in China,” in which I described the latest Bond film’s opening day in China as “disappointing.” These friends, who are significant stakeholders in Skyfall’s success, called me out for being too hasty in judging the movie’s opening based solely on the first day’s grosses, and they were right. I want to clarify why I wrote what I did, and more importantly, to offer a mea culpa for suggesting that Skyfall may already be a failure in China, which was certainly not my intent. Success or failure can only properly be judged against the backdrop of time and prior expectations. To be fair to Skyfall and those who have labored to release it in China, we should give the film a week or two to fully assess its trajectory. As for everyone’s pre-release expectations, I surely don’t know what every individual stakeholder was hoping for, but I would be surprised if most aren’t looking at last January’s release Mission: Impossible—Ghost Protocol (“MI:4”) as the comparable against which they are gauging Skyfall. That’s where I was looking when I wrote yesterday’s article. MI:4 is a good comp for Skyfall in several important ways. Both are big budget stunt- and effects-driven action vehicles that performed exceptionally well around the world before they arrived in the PRC (according to IMDB, MI:4 grossed $693 million worldwide, and Skyfall has just crossed over the $1 billion mark). Both experienced unfortunately long delays between their U.S. and China releases. Both opened during the late January, pre-Chinese New Year lull against little-to-moderate competition. And both faced the challenge of overcoming heavy pre-release piracy that undoubtedly cut into their Chinese theatrical grosses. I also felt that Skyfall had two meaningful advantages over MI:4. China’s theatrical film business is 30 percent bigger now than it was last January, as measured both by screens in operation and by average weekly theatrical revenue. And Skyfall also opened on far more screens—at least 30 percent more by my calculation—than MI:4 did. Indeed, with some 5,500 prints and perhaps 7,000 engagements, Skyfall enjoyed the widest theatrical opening in China’s history. Given all these considerations, my logic in looking at Skyfall is that it ought to gross at least 30 percent more than the $102.7 million MI:4 did last year in order for it to be considered a comparative success. So let’s call that a $133 million target. That may seem an unfairly high bar for Skyfall, but let’s not forget that in the past month alone China has seen Lost in Thailand and CZ12 easily exceed that threshold, while Life of Pi, a movie that grossed less than half globally what Skyfall has done, neared $100 million despite being pulled from mainland multiplexes after 30 days. So when Skyfall took in 31 million RMB (US $5.1 million) after its first day, compared to the 57 million RMB that MI:4 earned in its first day a year ago, I saw that as a disappointment. After its first two days MI:4 stood at 101 million RMB, or $15.7 million; Skyfall is now at 62 million RMB and US $9.8 million after its first two days. There’s an important difference in that MI:4 opened on a Saturday whereas Skyfall debuted on a less desirable Monday, but even so, I expected and hoped for more from Skyfall. It is entirely possible that the Bond film will kick into gear in the coming days and prove me wrong, and I sincerely hope that it does for the sake of my many friends who are involved in the movie, but to my mind the signs aren’t pointing that way. Still, I welcome the sort of feedback that my friends offered, and I was reminded by them that these humble musings of mine reach a large and important audience, so I ought to have chosen my words more carefully. I always welcome well-reasoned feedback that corrects any errors I may have made. I can’t say yet that I was wrong about Skyfall’s ultimate China numbers, but I do regret having inadvertently upset some of the film’s backers, and for that I wish to apologize. As always, please feel free to write me at rob@pacificbridgepics.com with your thoughts. This entry was posted in Opinion and tagged China box office, MI:4, Mission Impossible: Ghost Protocol, Rob Cain, Robert Cain, Skyfall by chinafilmbiz. Bookmark the permalink. I read the Variety piece on The Hobbit hitting the billion dollar club by March. There was a strong implication the China release on Feb 22 would push it over. But I’m wondering if The Hobbit will experience something similar to Skyfall when it opens. There’s no way to know at this point. But Hobbit faces an uphill battle with its weak post-holiday release slot, its SARFT-imposed 2-month delay in hitting China, and its piracy disadvantage. What it has going for it is China’s voracious appetite for well-made 3D and IMAX releases. Repeating my last post as my VPN dropped out in Beijing. You may have upset some backers but could be right about the long wait and piracy. 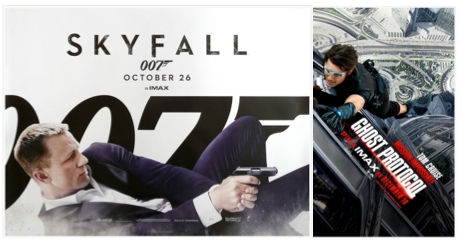 After seeing many Sky Fall posters in Beijing subways for months i think many did not want to wait for the film to come to the cinema and bought a copy. The only real losers could be the backers and Chinese distributors if you’re right. Let’s see how a couple of weeks all pans out for the film and it’s ticket sales here.. So Skyfall launched a Monday and MI4 a Saturday ? No possible comparison ! The weakest day versus the strongest… Skyfall still did 54% of MI4 D-day, and improved to 61% after the second day. I still bet on Skyfall to win against MI4. After the first full week I’ll see if it has really a chance. I think you forgot one big thing in the comparison: Tom Cruise, who is very popular in Asia. Just look at South Korea (MI4 – $51m; JB23 – $16m) or Japan ($70m & $31m). I don’t understand one thing : “piracy”. Maybe I’m wrong but I don’t think piracy in China is bigger than in USA or Europe. In France everybody illegally download movies, but most people wait for the French dubbing and the “DVDRip” and don’t like screeners, and cinema going is considered totally different from watching a movie at home, we go to the movies to escape from home and enjoy big screens, good sound, and be with friends and have a beer after and talk about the movie. If this is the same in China, I don’t think there has been a single one who watched the movie before its Chinese release. Do you think Chineses enjoy English-langugage movies ? Most of them don’t speak English at all ! Or they watch illegally subbed movies ?